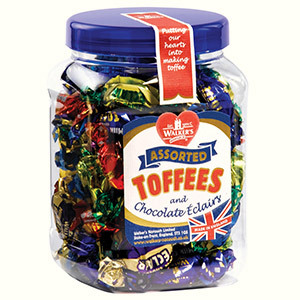 Our twist wrapped Assorted Toffees & Chocolate Éclairs in a 450g jar. 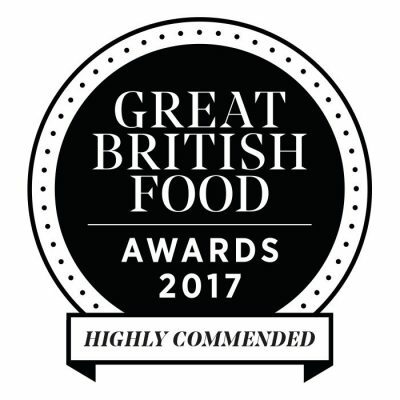 Glucose Syrup, Sugar, Sweetened Condensed Milk (from whole milk) 18%, Vegetable Oil (sustainable palm oil), Milk Chocolate ((Cocoa Solids 31.3% Min, Milk Solids 17% Min) sugar, cocoa butter, whole milk powder, cocoa mass, anhydrous milkfat, emulsifier: soya lecithin, natural vanilla flavouring), Dark Chocolate ((Cocoa Solids 70% Min) cocoa mass, sugar, fat-reduced cocoa powder, emulsifier: soya lecithin), White Chocolate (sugar, cocoa butter, whole milk powder, emulsifier: soya lecithin, natural vanilla flavouring), Butter 3%, Salt, Molasses, Emulsifier (E471), Flavourings. May contain nut traces. 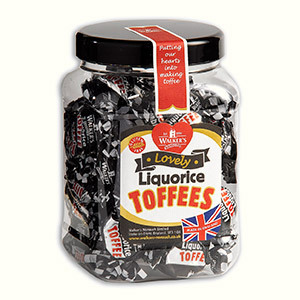 Our twist wrapped Liquorice Toffees in a 450g jar. 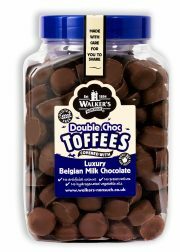 200 of our Double Milk Chocolate Covered toffees in a Jar. Approximately 1.8kg. Milk Chocolate 28% ((Cocoa Solids 33.6% Min, Milk Solids 20% Min) sugar, cocoa butter, whole milk powder, cocoa mass, emulsifier: soya lecithin, natural vanilla), Glucose Syrup, Sugar, Sweetened Condensed Milk (from whole milk) 16%, Vegetable Oil (Sustainable Palm Oil), Butter, Salt, Molasses, Emulsifier (E471), Flavourings. Contains Soy. 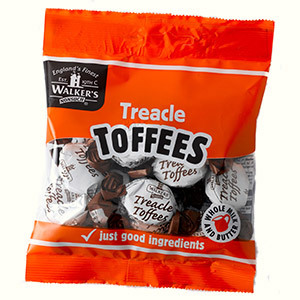 Our twist wrapped Treacle Toffees in a 105g bag. 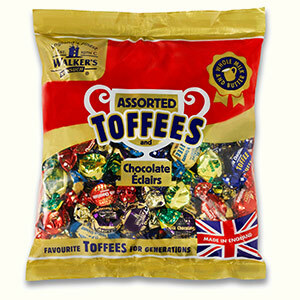 Our twist wrapped Assorted Toffees & Chocolate Éclairs in a 400g bag. 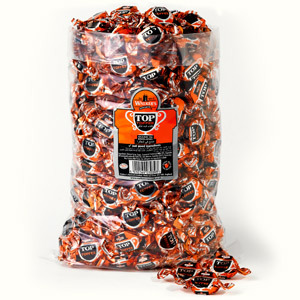 Our twist wrapped Top Toffees in a 400g bag. 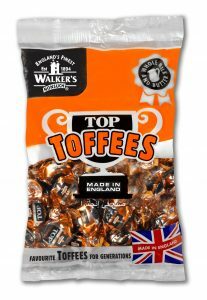 Glucose Syrup, Sugar, Sweetened Condensed Milk (from whole milk) 22%, Vegetable Oil (Sustainable Palm Oil), Butter 4%, Salt, Molasses, Emulsifier (E471), Flavourings. 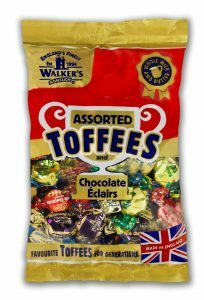 Our twist wrapped Assorted Toffees & Chocolate Éclairs in a 1kg bag. 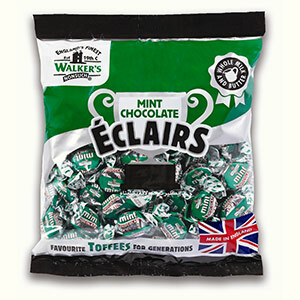 Our twist wrapped Mint Chocolate Éclairs in a 1kg bag. 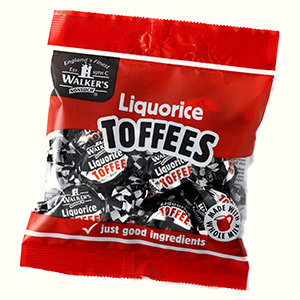 Glucose Syrup, Sugar, Sweetened Condensed Milk (from whole milk) 18%, Milk Chocolate 16% ((Cocoa Solids 31.3% Min, Milk Solids 17% Min) sugar, cocoa butter, whole milk powder, cocoa mass, anhydrous milkfat, emulsifier: soya lecithin, natural vanilla), Vegetable Oil (Sustainable Palm Oil), Butter 3%, Salt, Molasses, Emulsifier (E471), Flavourings. 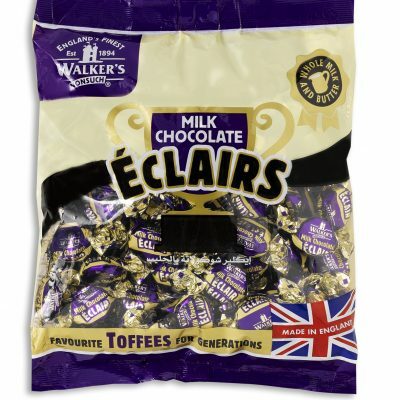 Our twist wrapped Milk Chocolate Éclairs in a 1kg bag. 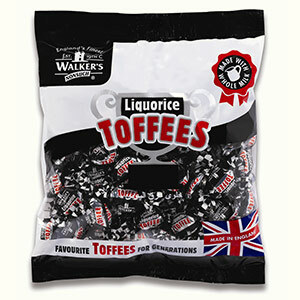 Our twist wrapped Liquorice Toffees in a 1kg bag. 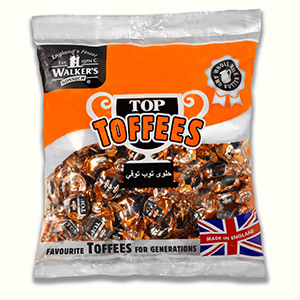 Our twist wrapped Top Toffees in a 1kg bag. 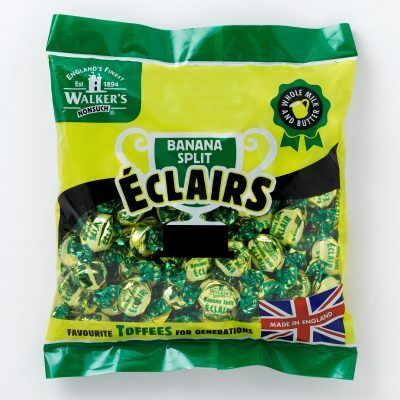 Our twist wrapped Banana Split Eclairs in a 1kg bag. 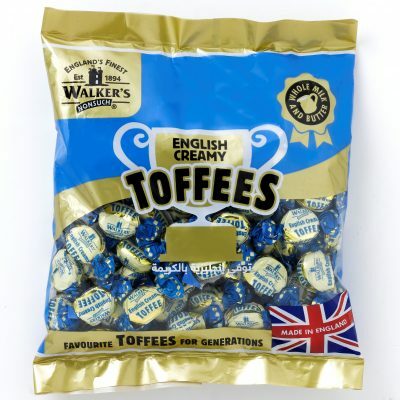 Our twist wrapped English Creamy Toffees in a 1kg bag. 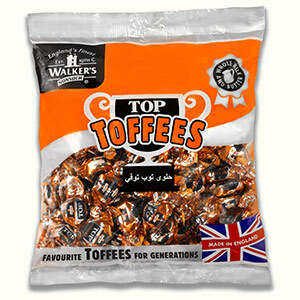 Our twist wrapped Top Toffees in a 2.5kg bag.